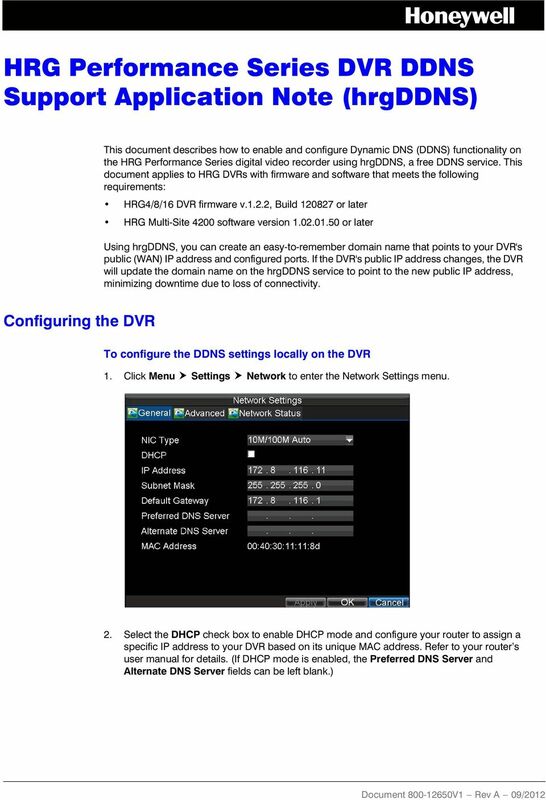 Download "HRG Performance Series DVR DDNS Support Application Note (hrgddns)"
2 2 hrgddns Support Application Note Note If your DVR is configured to use a static IP address rather than DHCP, you must fill in the Preferred DNS Server and Alternate DNS Server fields to use the DDNS feature. Contact your network administrator to obtain the preferred and alternate DNS server IP addresses. 3. Click the Advanced tab. 4. Next to DDNS, click Set. The DDNS window opens. 5. 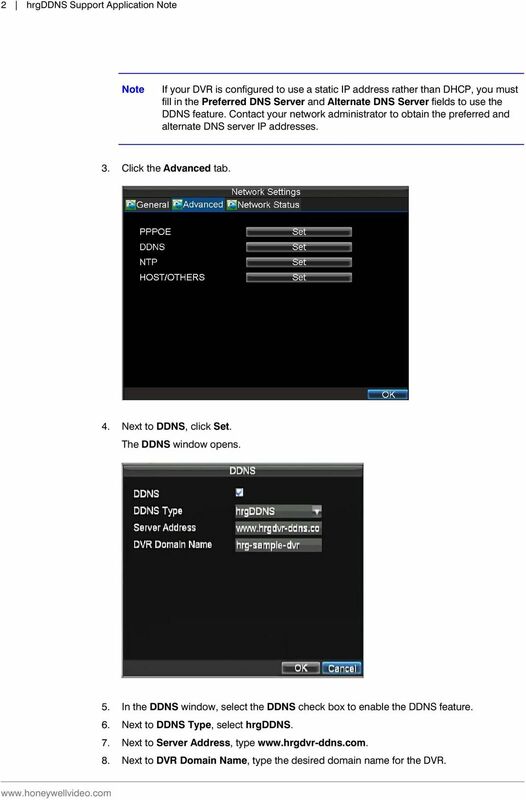 In the DDNS window, select the DDNS check box to enable the DDNS feature. 6. Next to DDNS Type, select hrgddns. 7. Next to Server Address, type 8. Next to DVR Domain Name, type the desired domain name for the DVR. 4 4 hrgddns Support Application Note 3. In the left navigation pane of the Device Parameters window, click Network, and then click the Advanced Settings tab. 4. Next to DDNS, click Set. The DDNS Settings dialog box opens. 5. 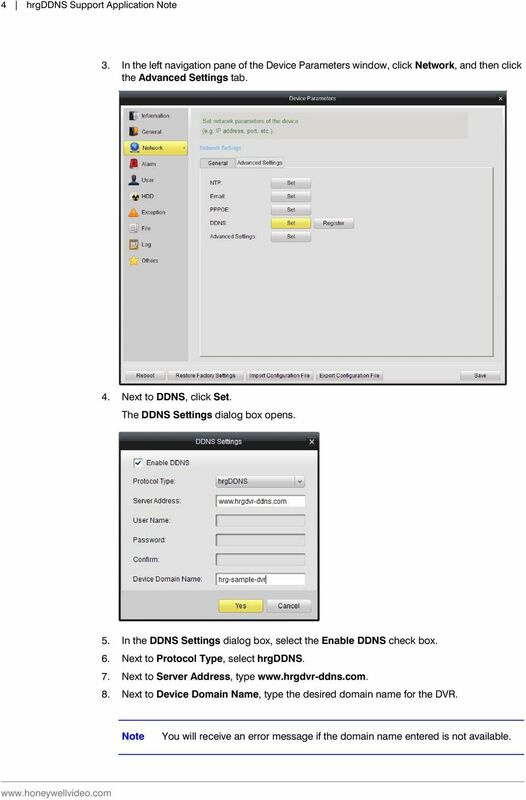 In the DDNS Settings dialog box, select the Enable DDNS check box. 6. Next to Protocol Type, select hrgddns. 7. Next to Server Address, type 8. Next to Device Domain Name, type the desired domain name for the DVR. Note You will receive an error message if the domain name entered is not available. 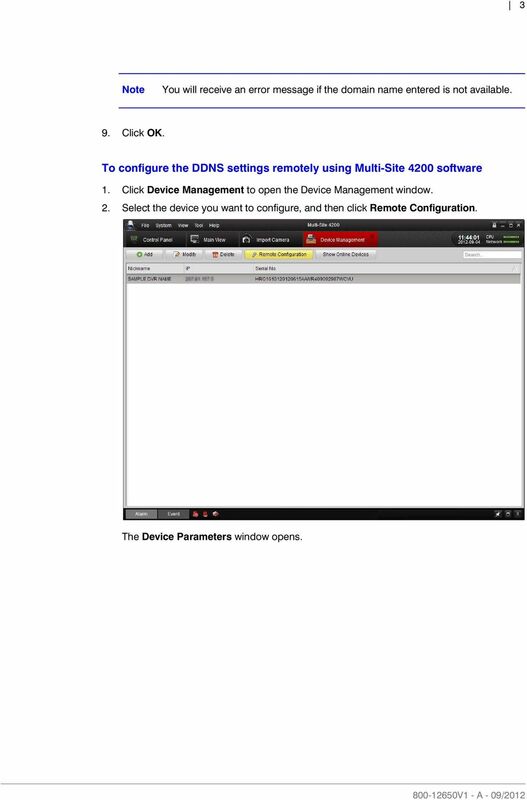 6 6 hrgddns Support Application Note Accessing the DVR To access your HRG Series DVR using a web browser Type in your browser s address bar. (For example, if your DVR s domain name is hrg-sample-dvr, enter To access your HRG Series DVR using the HRG mobile app 1. On the main menu, tap Devices. 2. In the Devices list, tap the DVR you want to modify. 3. In Device Detail, do the following: a. Next to Alias name, type the domain name of the DVR. b. Next to Register mode, select DDNS. 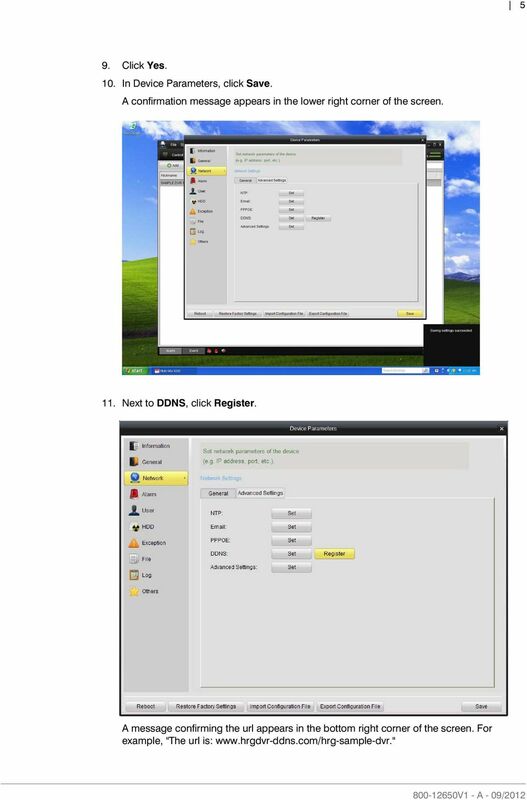 c. Next to DNS, type d. Next to Port, leave as 80. e. Next to User Name, type the DVR s user (login) name. f. Next to Password, type the DVR s login password. g. Next to Channel No., type the number of channels for the DVR (4, 8, or 16). Once the software has finished downloading, locate the ivms-4000(v2.0).exe on your hard drive and open it.